This report responds to a May 29, 2014 request from the U.S. Department of Energy’s Office of Fossil Energy (DOE/FE) for an update of the Energy Information Administration’s (EIA) January 2012 study of liquefied natural gas (LNG) export scenarios. This updated study, like the prior one, is intended to serve as an input to be considered in the evaluation of applications to export LNG from the United States under Section 3 of the Natural Gas Act, which requires DOE to grant a permit to export domestically produced natural gas unless it finds that such action is not consistent with the public interest. Appendix A provides a copy of the DOE/FE request letter. 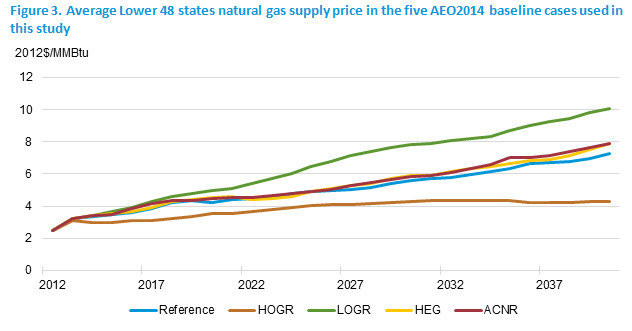 The report considers several scenarios, summarized in the chart, all of which show U.S. domestic natural gas prices going up, ranging from what looks like not quite doubling to . more than quadrupling.